102 pages, 5.5" x 8.5"
When he left the military after World War II, Charles Nelson realized that there was a realistic need for average citizens to be able to defend themselves against violent assault, so he opened his School of Self-Defense in New York City. During its five decades of operation, Nelson's school taught hundreds of men, women and even children. 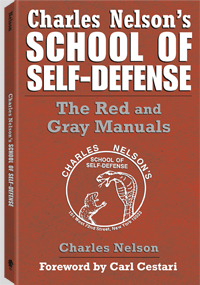 To reach more people than could personally attend the school, Nelson published two manuals on self-defense, commonly referred to as The Little Red Manual and The Little Gray Manual, both long out of print. Through these two booklets Charlie influenced generations of law enforcement officers, military personnel, martial artists and celebrities. Now for the first time, the two manuals have been combined to offer a comprehensive picture of the Nelson system of self-defense. Along with the faithful reproductions of the red and gray manuals, Charles Nelson's School of Self-Defense offers an illuminating look at Charlie Nelson by former pupil and World War II combatives expert Carl Cestari as well as a collection of photos from the life of one of the pioneers of civilian self-defense. Charles Nelson joined the Marine Corps in 1934 and learned hand-to-hand combat, bayonet fighting and jiu-jitsu from, among others, Colonel Anthony J. Drexel Biddle. From Sergeant Kelly, who had been attached to the International Police in Shanghai, China, in the 1930s, he learned a unique fighting method based on Mongolian wrestling techniques intended to maim or cripple, which no one else in the United States was teaching at the time.